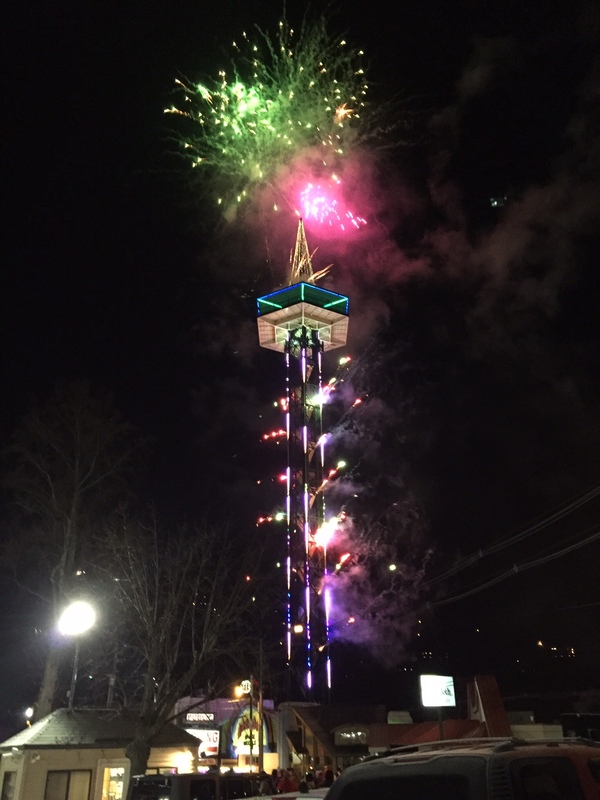 It’s New Year’s Eve as 2015 turns into 2016, and Gatlinburg and Pigeon Forge are getting ready to light up the Smoky Mountains with huge fireworks shows – and both events are FREE. For the 28th year, the Ball Drop & Fireworks at the Space Needle in Gatlinburg attracts a super-friendly gathering, estimated at close to 50,000 people this year, in one of the largest organized New Year’s events in America. 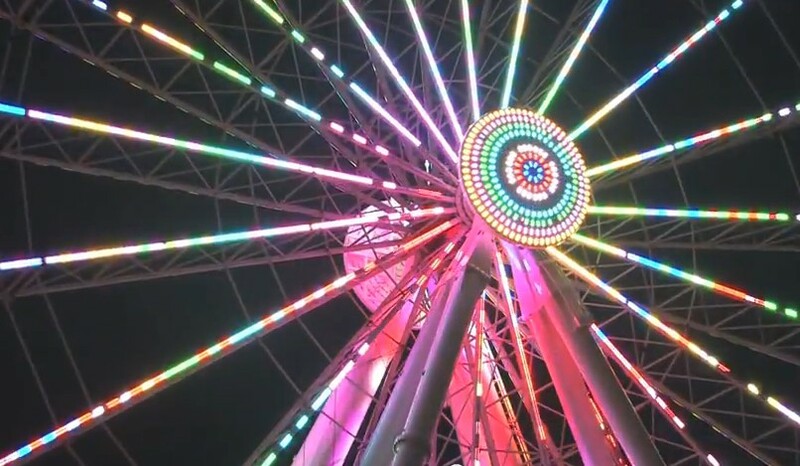 Meanwhile in Pigeon Forge, a more intimate party – by comparison – happens for the 3rd year running at the Island, home of the 200-ft tall observation wheel, food, live music, synchronized light shows – and Fireworks! In Gatlinburg, the location is Light #8 at Parkway and Historic nature Trail, by the Convention Center. Come early to find parking – be prepared to take one of the paid parking garages if the free lots are full. You may want to park further away and stroll Parkway towards the event. Show up any time in the evening that suits your constitution, crowds will be gathering early. Arriving by 9 pm should still get you a place close to the Needle. Dress comfortably and warm, and be ready to mingle. Food and hot drinks are readily available. A live band takes over the music at 11 pm, and close to midnight the night is lit up by camera phones as the countdown begins. This event gets your attention – in fact it’s a New Year’s Eve show you experience rather than attend. The Space Needle’s fireworks are a synchronized pyrotechnic show produced by Tennessee’s globally acclaimed Pyro-Shows company. Added to this mix are the sequenced LED lights pulsing in rhythm on the tower. Everyone is happy, and suddenly – Welcome to 2016! New Year’s Eve at the Island offers a free live band starting at 8 pm – Fairview Union, back again from last year by popular demand – along with synchronized light & music shows at the light fountain. The observation wheel is running, dining and shopping are in full blast, and the kids are on top of the world. And everyone is counting down. The perfectly named Island in Pigeon Forge has been a tremendous asset to the area in its its few short years so far, gathering a great collections of shops and restaurants woven in with a huge assortment of kids activities, games, rides, mazes, funny cars and wild attractions. The Observation Wheel is a Ferris wheel structure with 42 enclosed gondolas, climate-controlled and with wraparound visibility. Take a ride if you can – although this year the Island says that it may not be able to guarantee seats even with advance tickets. Call (865) 286-0119 for more information. The New Year’s Eve festivities at the Island are the place to be if you’re in Pigeon Forge. Parking is free also, the setting is glamorous and family-friendly, and the Ball Drop & Fireworks shows is spectacular. Here are the Space Needle and Island websites. Stay warm, have fun…and Happy New Year!